by Col. Emmett F. Knight, USA, Ret. 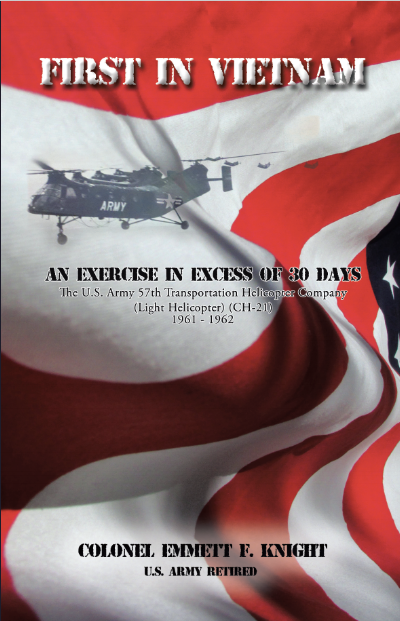 The second, and revised edition of Colonel Knight's experiences as helicopter pilot in Vietnam from 1961-1962. Describing, in detail, missions in an era when most didn't know the United States had a presence in Southeast Asia. This book is about the continuation of someone else's war and the very early days in the assumption of that war by the United States of America. It is set against the beginning of a major expansion of our advisory effort supporting the South Vietnamese Government which was fighting against an expanding guerrilla war supported by the communist North. North Vietnam was in turn supported by both China and Russia, thus setting the stage for an essentially no win situation. The geopolitical problem was, of course, of limited concern to most of those soldiers who fought there, including the men of the 57th Transportation Helicopter Company. As conditions worsened they just went out and flew the missions including the first heliborne assault of the war and for a year afterward. In words written at the time, this was a period when they were not going by the book, they were writing the book on helicopter combat operations. This is their story as told by the operations officer that led the flying activity in the unit. It is a description of the training, deployment and first missions in Vietnam. It recounts the serious aspects encountered in the early days, but it also tells of the accidents, incidents and the humorous side of things that are often left out of wartime accounts. There are chapters about dealing with the United States Air Force and the United States Marine Corps as they entered the fray. Not the least of the story has to do with the interaction between the author and some of the more senior officers involved in the war at that time. In those cases, the author often contradicts the official view and draws uncomplimentary conclusions about their conduct and eventual impact on the Vietnam War.